​Elvis had complained that he couldn't hear himself on stage. 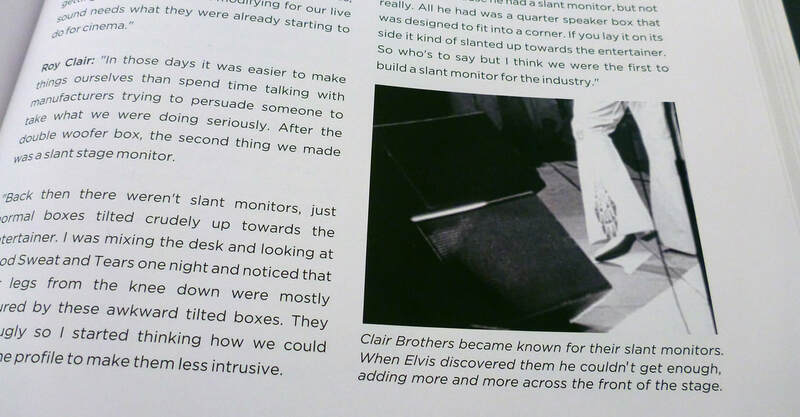 On his first tour with him, in November 1971 (the first also for Clair Brothers), Bruce introduced the slant stage monitors that Clair Brothers had recently developed. At first, Bruce mixed them sitting alongside Bill Porter at the main desk. Stan Horine would be stageside talking to Bruce throughout the show. Bruce would hear through his headphones instructions from Stan, 'Can you increase the volume a little? ... a little more ... OK that's it.' That was never going to work. From Clair Brothers' second tour onwards, Bruce mixed stage monitors adjacent to the stage. He and Elvis learned to communicate with each other via a subtle look or hand-signal. we were doing seriously. After the double woofer box, the second thing we made was a slant stage monitor. Back then there weren't stage monitors, just normal boxes tilted crudely up towards the entertainer. I was mixing the desk and looking at Blood, Sweat and Tears one night and noticed that their legs from the knee down were mostly obscured by these awkwardly tilted boxes. There were ugly so I started thinking how we could lower the profile to make them less intrusive. It occurred to me that if we built a speaker box that sat flat on the stage but held the speaker on a slant, we could reduce the height of the current system by half. One of my biggest interests was woodworking so I had no problem making all our speaker boxes myself and making modifications along the way to be sure they were stiffer than other boxes. Then I did the doubling up with the speakers to see if that worked, and it did. I went home and built in the workshop what I had in mind for a slant monitor and got JBL components to fit into it. We then developed it for Blood, Sweat and Tears. At that time they were renting an old tilted box system from McCune in San Francisco. I asked the band manager, 'If we did a better stage monitoring system would you be interested?' The said, 'Yes Roy, of course.' So Blood, Sweat and Tears were the first to use our slant monitors. Bill Handley said they should have asked him because he had a slant monitor, but not really. All he had was a quarter speaker box that was designed to fit into a corner. If you lay it on its side it kind of slanted up towards the entertainer. So who's to say but I think we were the first to build a slant monitor for the industry." - Roy Clair. 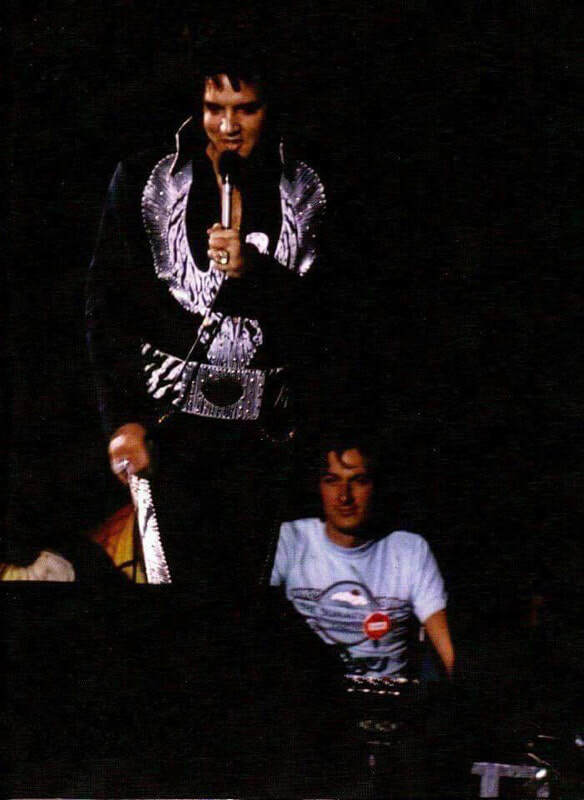 Clair Brothers was contracted in 1971 by Tom Hulett to go on tour with Elvis and do every show, where previously a variety of regional sound companies were used. Clair Brothers brought quality, consistency and endless innovation to Elvis's sound, such as Roy's super-tight double-woofer box and slant monitor. And so things continued to improve for Elvis over the next six years with Clair Brothers doing every show. The full story is in the book, a fascinating look into rock'n'roll history. 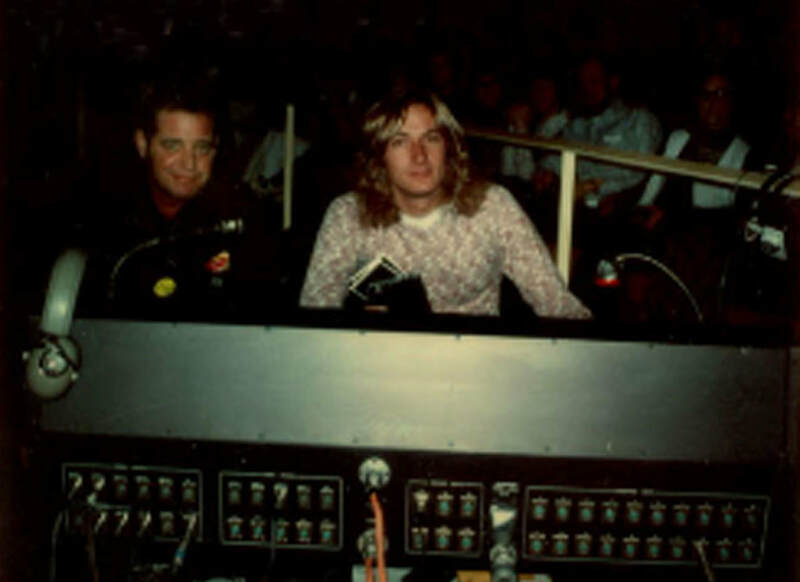 Elvis' record producer Felton Jarvis often sat stageside with Bruce at the custom monitor console that Bruce designed.